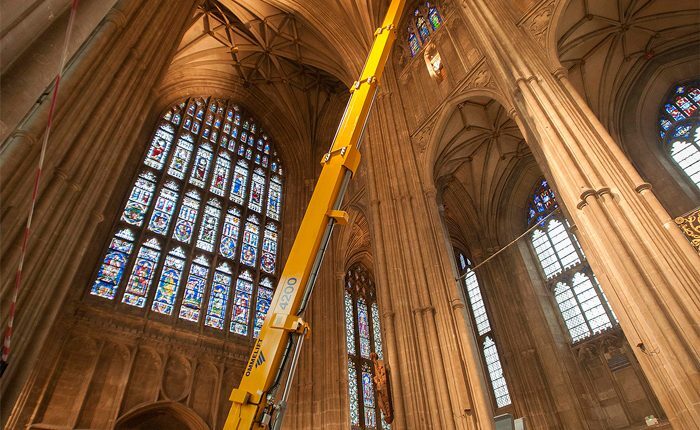 A crawler-mounted boom lift was recently used to inspect stonework and stained glass at the Canterbury Cathedral in the United Kingdom. The cathedral is the Mother Church of the Anglican Communion and the seat of the Archbishop of Canterbury, and it required an inspection survey in preparation for the proposed conservation. This included the Nave roof and West Towers, together with stone masonry to the upper Nave buttresses and conservation of the Nave’s stained glass windows. Using an Ommelift 4200 RBDJ crawler-mounted boom lift rented from Paramount Platforms, the cathedral’s team accessed the 82-ft.-high interior vaulting of the Nave The team then used the same machine outside to inspect the stonework on the West Towers, which is 138 ft. above ground. The non-marking tracks distributed the machine’s 15,003-lb. weight over a large area, reducing ground pressure so there was no risk of damage to the floor of the Nave. The tracks also helped the machine to traverse slopes and work comfortably outdoors. The conservation project is funded by a major grant from the UK Heritage Lottery Fund (HLF), plus significant support from private individuals, charitable trusts and foundations. Part of The Canterbury Journey project, it aims to radically transform the accessibility and sustainability of the cathedral, which is part of a UNESCO World Heritage Site. Heather Newton, the head of Stone Conservation at Canterbury Cathedral, said the boom lift was invaluable in surveying the church. “It enabled Jo Deeming, the Cathedral’s Surveyor to the Fabric, and others to assess the condition of the stonework and more accurately scope the work for the ‘Canterbury Journey’ HLF projects,” she added.